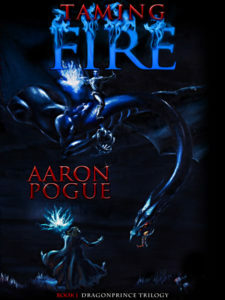 OKLAHOMA CITY – Bestselling author Aaron Pogue is publishing the third book in his successful fantasy trilogy. Given the excellent performance of the other books in the series, this book, The Dragonprince’s Heir, will sell thousands of copies in its opening week and has the potential to make as much money as the first two books put together. None of that is what Pogue wants you to know about the book, though. What makes a successful author, one who was only recently able to quit his day job as a technical writer, give away the ownership to an intellectual property worth hundreds of thousands of dollars? Pogue believes that copyright has become a tool for exploiting artists. He says it’s time for a cultural revolution where art is valued as art and not as a commodity, but not at the expense of artists making a living. It isn’t as crazy as it sounds. Pogue is already bringing this “new patronage” about with his non-profit arts organization, the Consortium. The Consortium is a non-profit organization comprised of schools and students that will produce art for the community, all while making a decent living. Pogue believes the key to this model is a reinvention of the patronage system that succeeded during all four centuries of the Renaissance. You can read a more detailed explanation of how Pogue will use the Consortium to bring the plan to fruition. But so far, the model is working. As the organization’s president, Pogue is the Consortium’s first paid artist and also the main source of financial support. The first two fantasy novels in his bestselling Dragonprince trilogy have sold thousands of copies and made a tidy profit. This profit has been invested back into the Consortium to launch the successful publishing arm of the organization, Consortium Books. Pogue believes that if artists were paid a decent salary for making creative works initially, they wouldn’t have to worry so much about intellectual property law and copyright. That’s all he expected from Taming Fire and The Dragonswarm, the first two novels in his trilogy. Once each title made $30,000, he authorized the Consortium to release them into the public domain. As of this month, Taming Fire and the The Dragonswarm are both dedicated to the public domain. The Consortium has released them under the Creative Commons No Rights Reserved license. But Pogue wants more for the third novel. He wants it to be in the public domain from the first day it’s published. And he’s turning to cloudfunding website Kickstarter to make it happen. For the month leading up to publication, Pogue is using Kickstarter to raise the $30,000 necessary for the Consortium to secure the rights to his novel without a single copy sold. Whether you are an art lover or simply feel copyright is no longer a useful system, the Consortium would appreciate your help. The easiest way to show your support is by purchasing Consortium art. The publishing arm is funding the organization through published works. The Consortium has both full length novels and short stories, both individually and in collections. But the best way to support this vision of the future is by contributing to the Kickstarter campaign that will immediately purchase the rights to The Dragonprince’s Heir. Please visit that link for more details on the organization, to look over the contribution rewards, and, finally, to contribute to this revolutionary new idea. E-authors face a lot of competition. Even though they have a pricing advantage over traditional publishing companies, there are already many inexpensive and free e-books available. This means that low prices are not enough. E-authors have to find additional ways for readers to notice their books and become interested in reading them. E-authors create a positive first impression when they have book covers that look professional and excellent book descriptions. The cover is usually the first impression of an e-book that readers have when they are surfing online. On most websites, a cover image is small but can also be viewed at a larger size. A quality design will look sharp in both sizes instead of blurry. The title should also be readable in both sizes. Some e-authors create their own covers with a specialized program or a graphic design program. If they do not have the time, skills, or desire to do it themselves, then they hire an individual or company to help. The cover is important because it shows the book’s “personality,” giving potential readers a glimpse of what to expect. Another way e-authors can create a good impression is by having well-written book descriptions. When online shoppers click on a book, the description is usually the first text that they see on the page. It is positioned far above the reviews, so if shoppers do not like the description, they will probably not read the reviews. The description tells what the book is about and attempts to create interest in the reader. It also helps shoppers determine what the genre of the book is and what makes the book different from others in that genre. Some books do not have a description at all, which makes it difficult for shoppers to tell what the book is about, especially if the book does not have any reviews either. Shoppers are less likely to buy a book if the only information they have to go on is the cover. Since the description is usually the first thing that shoppers will read, proofreading carefully is important. Errors in a small block of text could give the impression that the book also will have a lot of errors. Ultimately the quality of the book’s contents matters the most, but a favorable first impression is a crucial aspect of being a successful e-author. Allison Scott is an editing intern with the Consortium. She’s also an English/Writing major at Oklahoma Christian University and a member of Sigma Tau Delta. Today many authors, sometimes called e-authors, are self-publishing e-books instead of signing contracts with large publishing companies. Some established authors have switched to self-publishing because they want more decision-making power and better royalties. Other authors, after establishing themselves through self-publishing, have signed book deals so they can have more time to write instead of having to do everything themselves. A lot of overlap exists between the two methods of publishing, particularly among best-selling authors. This is important to keep in mind when discussing the success of the e-author. The majority of e-author best-sellers cost under $3. Having lower overhead costs gives these authors a pricing advantage over publishing companies. Inexpensive entertainment catches attention, especially in a struggling economy. Both high-volume readers and occasional readers appreciate bargains. A low price attracts impulse buyers who ordinarily wouldn’t buy a book by an unknown author. Some e-authors have concerns about low prices. First, potential readers may associate a low price with low quality. Then they won’t buy the book, or they won’t end up reading it since they didn’t invest much in it. However, e-authors have challenged this negative association by attractively presenting and marketing their work. Another common concern e-authors have is that they would have to sell large quantities to make an excellent profit. The definition of an excellent profit varies by the individual. Part of the definition is based on whether an e-author is writing books for a living or simply for extra income. Earning a lot of money from writing is challenging for most authors whether they self-publish or not. E-authors set their prices low for various reasons. Some have been able to make excellent profits from selling large quantities of inexpensive books, especially if they have many titles available. With Amazon, e-authors earn a 35% royalty from a .99 cent book sale and a 70% royalty from a $2.99 sale. Even though the prices are low, the royalties are a higher percentage than the typical ones offered by publishing companies. Other e-authors use the low-pricing strategy primarily to build up their audience. They plan to make most of their profits by selling more expensive books, or other products and services. Ultimately, self-publishing benefits both authors and readers. E-authors have the freedom to decide what price works best for them, and readers have a large selection of inexpensive, unique books to choose from. Amy Ellingson is an editing intern with the Consortium. She’s also an English/Writing major at Oklahoma Christian University, a member of Sigma Tau Delta, the National English Honors Society, and an editor for Soundings, the literary journal of Oklahoma Christian. Literary trends come, and they go, but there is one genre of literature that has crazy staying power: romance novels. When first researching the top trends in current literature, it broke my heart to see that romance novels are at the top of the sales. Romance Writers of America cited that romances brought in a whopping $1.358 billion in the United States in 2010, leaving religious and inspirational books ($759 million), mysteries ($682 million), science fiction and fantasy novels ($559 million), and classic fiction ($455) far, far behind, as far as profits go. These numbers beg the question: how do romances keep up such high revenues? Why is this particular genre so popular? The answers flood back. One response rests in America’s declining economy. While the economy continues to plummet and stress and depression levels rise, readers want a quick read with a happy ending. While other genres are suffering under the weight of the economy, romance novels show that they have the ability to soften the blow of low bank accounts as they give their readers happy endings in difficult times. Motoko Rich, writer for The New York Times, notes that romance novels are inexpensive and therefore, the buyer feels little guilt when indulging in this guilty pleasure: “So many of the books are sold in the mass-market format, smaller paperbacks often found on racks at the grocery store or in airport bookshops. These books sell for $7.99 or less.” Not only do these books uplift the sad soul, they are also inexpensive and, therefore, are financially easy book to buy. Along these lines, eBook and smaller publishers accept a wider variety of fiction and topics that include more taboo subjects, which are often more difficult to find within a larger publication because of their restrictions. These books put out by smaller publishing companies are also sold for a cheaper price because the publishers do not have to pay a warehousing fee. Because of this, these novels are sold at discount stores such as Wal-mart and are commonly selected impulse buys that readers purchase as they wait in the checkout line. The pain I feel knowing that romances are the most commonly purchased and read books subsides when I understand the reasons for their high sales. People in our current economy need quick, upbeat reads that sell for cheaper prices and are easily accessible, all of which a good romance can supply. Joshua Unruh is a writer with the Consortium. He’s also a fan of comics, graphic novels, and tabletop games, and he’s offered to share that experience with our readers in a regular column. You can read more of Joshua’s work at his site, JoshuaUnruh.com. That’s how the novel version of The Hunter starts and it was retained for the graphic novel adaptation. I considered it a good omen. And I was right. The Hunter was originally a novel by Donald Westlake operating under the nom de plume of Richard Stark. It has been adapted into graphic novel form and illustrated by Darwyn Cooke. These two guys have an amazing pedigree separately. Together? Well, Westlake is a grandmaster and Cooke is a natural to adapt Westlake’s work as Stark. Westlake has written over a hundred novels and non-fiction books. He’s won the Edgar Award three times and is one of two authors to win it in three different categories. The Mystery Writers of America named him a Grandmaster in 1993 which is the highest honor they can bestow. He specializes in crime fiction including capers and has branched into sci fi and other genres as well. So the guy is damned talented and if it’s a story where bad people do bad things to other bad people, he seems to get even more talented when he calls himself Richard Stark. Cooke is an Eisner winning writer, illustrator, cartoonist, and animator. His best known works, before he started adapting the Parker novels by Westlake, were all for DC comics. He did a turn on Catwoman that included a caper story called Selina’s Big Score. He oversaw DC’s reimagining and relaunch of The Spirit. And, most impressive, Cooke did a studied look at the time that bridged the Golden and Silver Age of comics by way of a well-written and beautifully drawn story called DC: The New Frontier. So the man knows what he’s doing on capers, crime books, and books set in the 60s. That pretty much covers several of the Parker novels and certainly describes The Hunter. The Hunter was first published in 1962. It introduced us to a man named Parker, a professional robber. Professional robber means smart, ruthless, tough, and willing to do what the job required although Parker has no particular love or squeamishness for killing. The jobs were always heists, bank jobs, or payroll hits. The Hunter finds Parker freshly returning from a double cross that nearly killed him and did wind him up in jail for a while. He was double-crossed by a partner and his wife. Now he’s back and wants revenge. Revenge and his $45,000 dollars. He’s willing to do whatever he has to do to whomever he has to do it in order to get both. If that sounds familiar as a plot hook then it’s probably because the book has been adapted into film at least nine time. Nine times! Including my first brush with it, Payback starring Mel Gibson. (Which had a Director’s Cut released as well, so it might be ten times if you count them as two different movies – hint: you should.) As far as I know, though, this is the first time that it has ever been adapted into graphic novel form. And, like I said, there’s nobody more perfect for the job than Darwyn Cooke. …just as well as suit and tie wearing hard guys. But like I said, for the most part the art is tonally perfect and executed beautifully. I’ll use the opening twenty pages as an example. It introduces us to Parker at a distance and walks with him as he stalks across the George Washington Bridge. He visibly frightens a woman as he goes past, has a wordless interaction with a waitress, jumps a subway turnstile, hits the DMV, and makes a fake driver’s license. The physical book is as beautiful a package as the art that graces the cover and every page within. It’s a hardcover and the pages are a thick, sturdy stock with a great texture that begs to be read and reread. Just turning the pages is an enjoyable experience that is reminiscent of yesteryear when books were built to last. The endpaper has a geometric style very much of the 60s so that you’re being told something about the story even before you get to the first page. Richard Stark’s Parker – The Hunter is pretty much the perfect little volume to introduce you to both Westlake and Cooke’s work. And it’s a rewarding experience as both a story and a physical object. I recommend it highly to fans of crime stories, thrillers, or those who just want to take a walk on the wrong side of the tracks with a bad man indulging in a little hard revenge. And the best news is that Westlake wrote many, many more Parker novels. And IDW Publishing plans on putting most, if not all, of them out as fast as Cooke can adapt them. Recently I had the good fortune to discover a hilarious and poignant webcomic in Max Overacts. Max is created by Caanan Graal and you can find it at his website, Occasional Comics. Through various machinations I came into possession of a collected story he’d created for Zuda Comics. It’s about a vampire hunter who finds herself in the body of a young girl. She has a plethora of sidekicks in a Frankenstein made from other Frankensteins, a shapechanging ex-husband, an indestructible neighbor boy, and the tooth fairy. Together they fight crime…er, vampires! This thing sounded right up my alley. Plus, I wanted to put a spotlight on a talented individual who I knew was struggling as an artist which is obviously close to the Consortium’s heart. I sat down to read Celadore and give it a glowing review. The only problem was, it wasn’t very good. Wait, that’s not exactly true or fair. I had a guess that the book was actually quite good but it had gotten a hack job done on it when it was translated from flash-based webcomic to printed collection. So I contacted Canaan himself to get his perspective. It turns out I was right. But more on that in a minute. First, a little background: Zuda was an imprint of DC Comics that specialized in online, flash-based webcomics. This was a revolutionary and exciting piece of news at the time and I was sad to see it fold. I have all kinds of editorial on why that happened and the quality of the work doesn’t enter into it for even a second. But that editorial is for another time and place. The coolest part of Zuda, to me, was that new stories could compete against one another for contracts. I’m going to send you to the wikipedia article to explain it properly. Zuda had competitions that were open for comic creators to submit their own eight-page comics. Each month ten were selected to compete by editorial. Users could vote for their favorite and the winner received a contract to continue their comic on Zuda with 52 more screens. When the contract was filled, if the comic was liked enough it could be renewed for an additional “season”. Occasionally an “instant winner” was chosen to receive a contract without having to compete. In July 2008 an “invitational” was held where some well liked comics that had not won were invited to back to compete with an additional eight pages apiece. Celadore won the May 2008 competition. But by the end of 2010 the Zuda imprint was folded into the new digital publishing arm of DC Comics which has, since then, done sweet fanny adams beyond scanning existing comics. Again, that’s editorial that belongs elsewhere so I’ll move on. As for the book, Caanan has a clean, cartoony style that is fluid for broad comedy and physical action but also manages to give the faces bigger-than-life reactions. Despite the cartoonish nature of these facial expressions, there is a great deal of emotional depth in these characters. A mother whose child is missing is just as lovingly and believably rendered as the outrage of a centuries-old vampire hunter at being stuck in the body of an 8 year old girl. The cast of characters show obvious imagination and cleverness as well as being an endless source of amusement in and of themselves. Caanan’s writing style is similar to his art in that these characters that are initially painted in broad, often comical strokes wind up showing the deep emotional wells of true characters. All that’s the good news. The bad news is that this presentation of Celadore makes it difficult to enjoy the story. The panels are broken up in ways that don’t make reading the story easy even for somebody with thirty years of comic reading experience. The art is very, very dark which makes that fluid action I mentioned difficult to follow. Also, some of the emotional scenes are overshadowed, pardon the pun, by the coloring. I read this book twice and did not enjoy myself. But I usually greatly enjoy Caanan’s work on his site! I read almost no webcomics and the ones at Occasional Comics grabbed me and wouldn’t let go! He knew how to do “page layout” and action and coloring! Something had to be terribly wrong. So I emailed Caanan and, before I could really mention my issues, he explained why they were what they were and how they happened. His candid and conversational emails told me just what I expected to hear. He and I had to talk about how the medium informs the story you tell. The medium might be a 21″ monitor compared to a 6.6×8″ book or it might be the demands and expectations of a publisher. In the case of Celadore, it happens to be both. Please follow me over to my own blog for the next few posts as I discuss this with Caanan in more detail. Hopefully we’ll all learn something. Especially me. 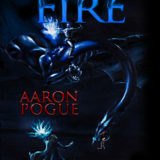 Consortium Books is proud to announce the digital release of Taming Fire, an epic fantasy novel by Aaron Pogue. Daven Carrickson grew up as a beggar in the filthy alleys beneath the shadows of the palace. He’s the son of a known thief, disgraced and despised. His only real talent is his ability with a sword, and his only real chance at finding honor or a home is a desperate dream of joining the King’s Guard. Then Daven receives a new future when Master Claighan invites him to study magic at the Academy. The wizard offers to make him into a new kind of soldier: a swordsman equally skilled with forged blades and mystic forces. It only helps that Daven has no home, no family, and nothing left to lose. But when conspiring forces destroy the wizard’s plans, Daven finds himself wanted for treason and murder. Hunted by a great black beast of a dragon, caught between the King’s Guard and a rebel force led by a rogue wizard, Daven’s only hope of surviving is to become more than he’s ever dreamed possible. Get your copy for $0.99 at Amazon.com! Other formats (including a $12.99 paperback) are coming soon. I am happy to announce that we finally have a webpage for our arts contest. Actually there are 3 pages. Consortium Arts Contest and Fundraiser: A description of the event with details like date, time and location. Art Contest Guidelines: Lists guidelines concerning the art contest. Submission Form: A submission form for those ready to enter their work in the contest. I’m about four days away from going back to school, for the first time in nearly a decade. I’m looking forward to it with a nervous anticipation. This week I stepped out of my expertise and pretended to be a businessman. I started out playing manager at Sunday’s Webserver Setup Meeting (the one I mentioned last week), but that mostly consisted of waiting until all my programmers were there and then running up to the store to buy some refreshments.